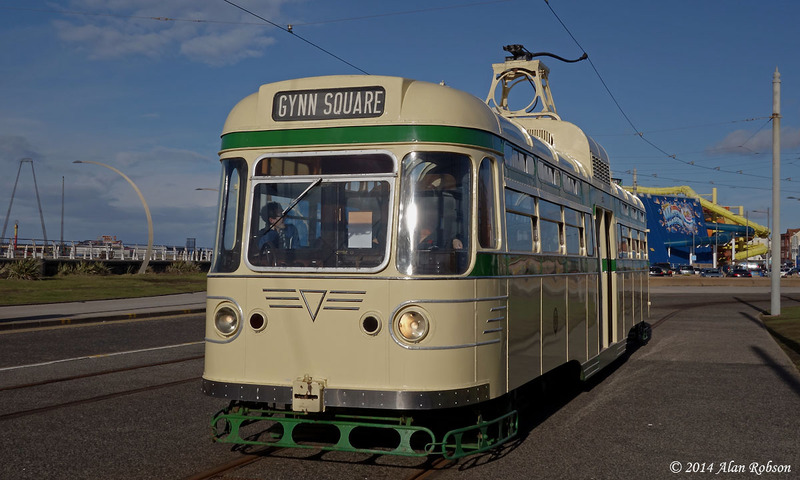 In scenes more reminiscent of the days of traditional tramcar operation, a Brush Car has been seen running with training vehicle 'L' plates on for the first two days of this week. 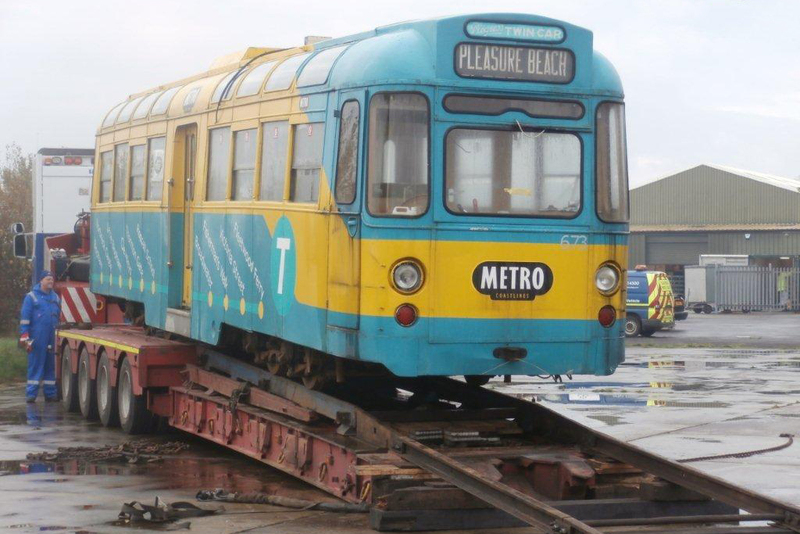 On Monday November 17th, Brush Car 631 from the heritage fleet was noted out on the tramway wearing 'L' plates, and the following day 631 was again seen on driver training duties. 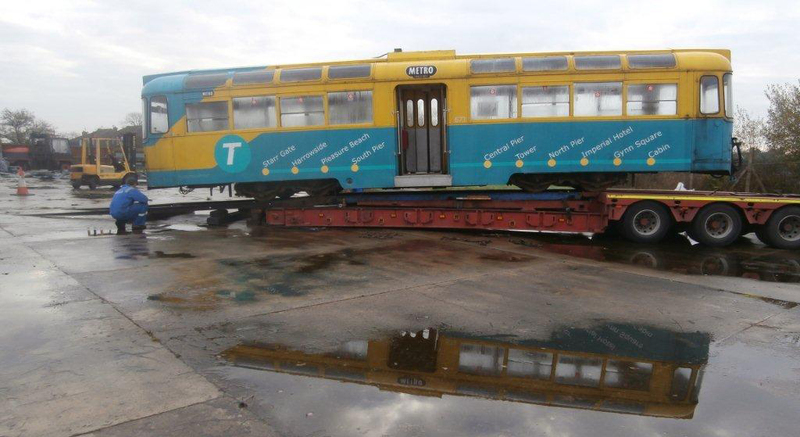 Note, the photo of 625 below illustrates how the bumpers have been fitted in the incorrect position on 631 during its restoration, they are too far inboard and should have been positioned further back around the sides of the cab. 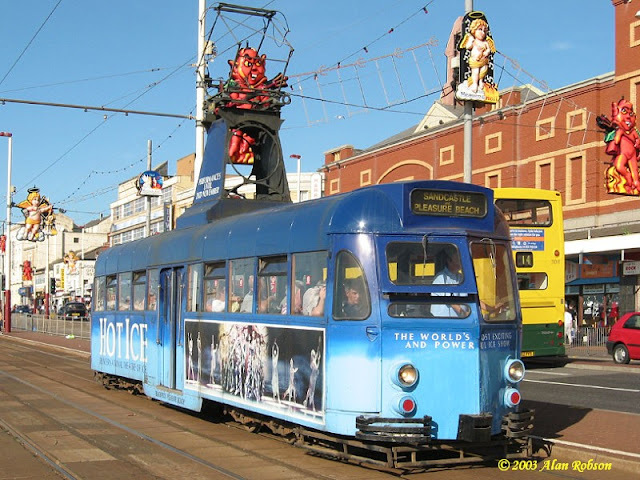 Brush Car 631 was noted in use on a private hire on the Promenade on Thursday 13th November. 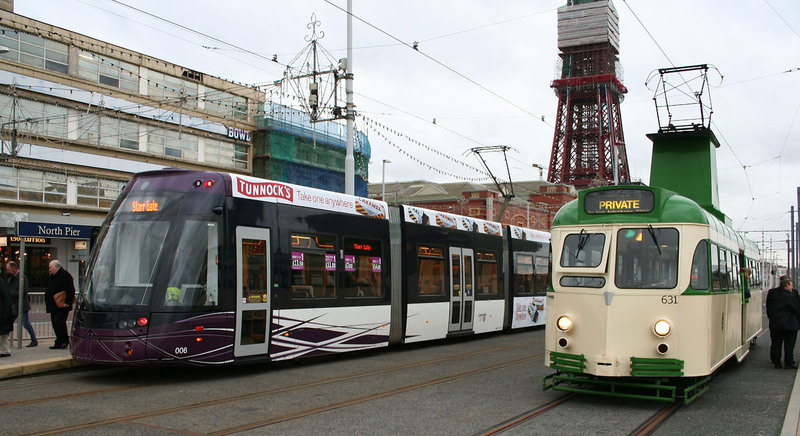 A film crew were planning to capture the tram passing the Tower. 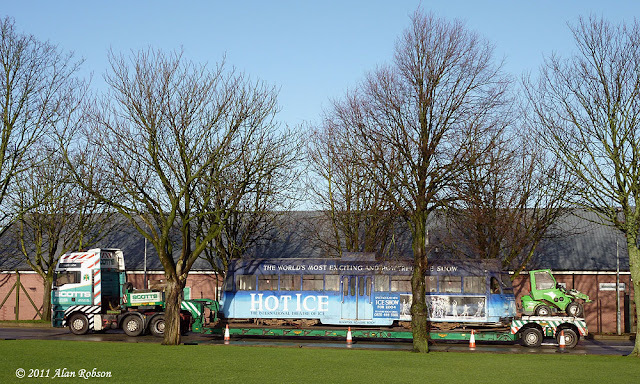 The Fleetwood Heritage Leisure Trust had been given notice that the remaining trams that they had stored at Kirkham Prison in Lancashire needed to be removed from the premises. 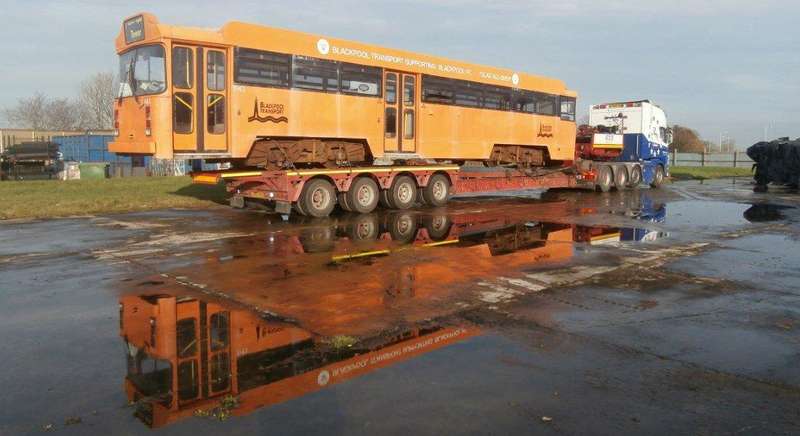 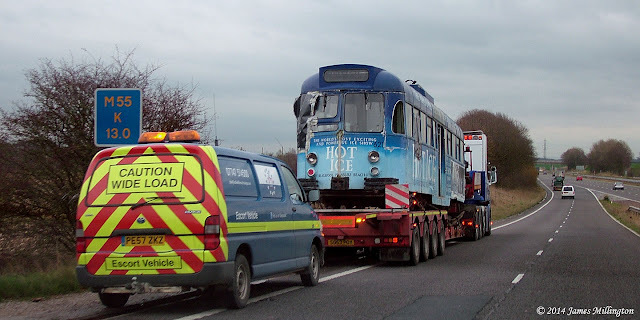 Beginning on Monday 10th November the trams began to be transported away to other storage facilities. 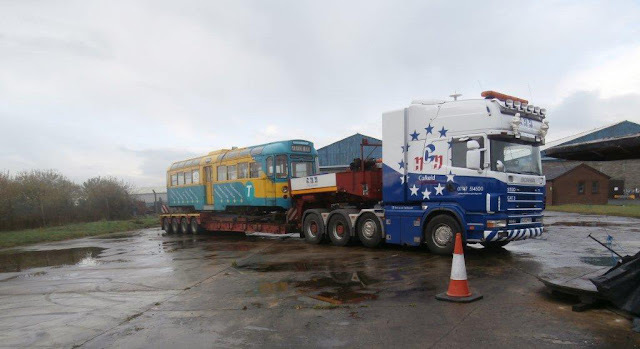 Twin Set motor car 673 and Centenary 641 were both moved to the groups open compound within the private port complex at Fleetwood Fish Dock. 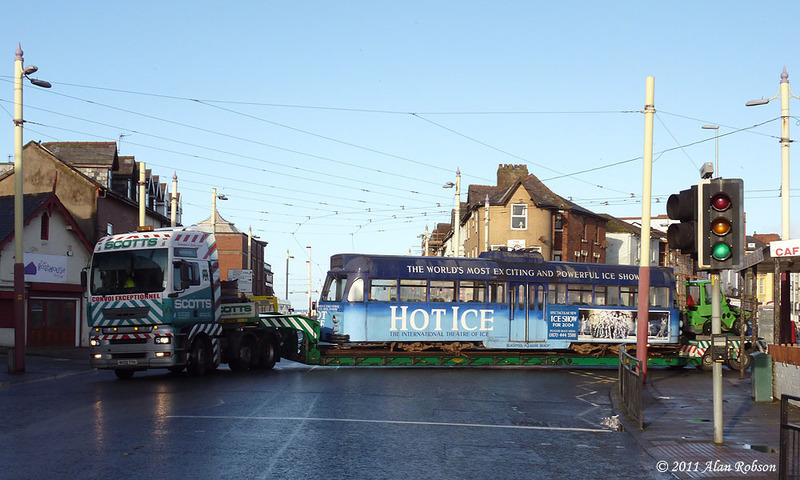 The two trams would then be reunited with the other FHLT trams, Balloons 710 & 726, Railcoach 678, Twin Set trailer 683 and Centenary 643. 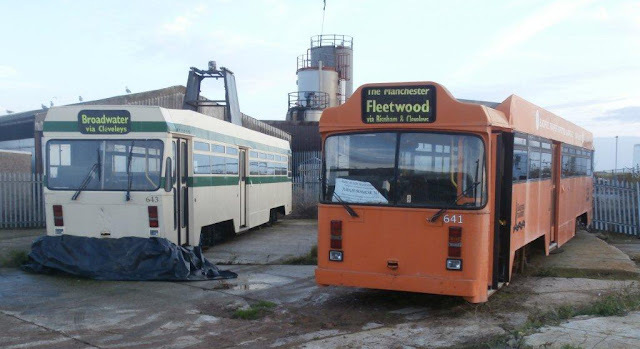 All the photos used in this report are by kind courtesy of Colin Macleod and the Fleetwood Heritage Leisure Trust. 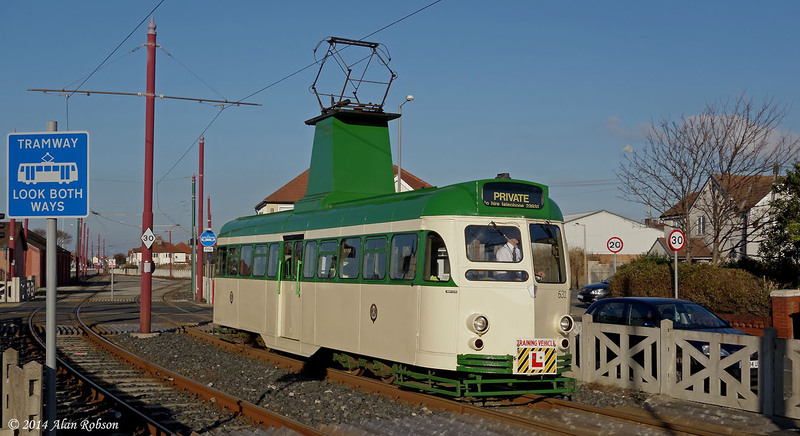 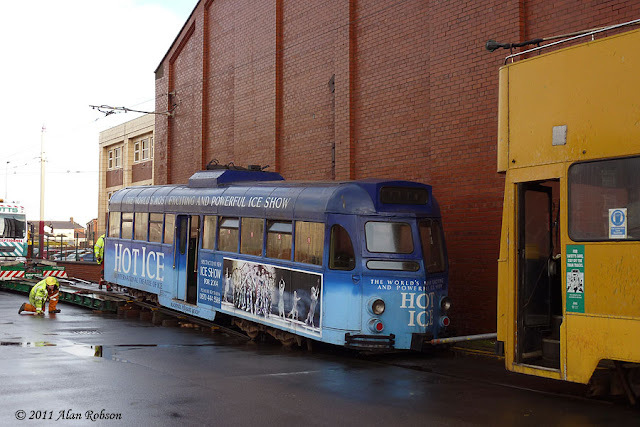 As part of the reappraisal of their assets, the Fleetwood Heritage Leisure Trust have agreed to allow a consortium of like minded tram enthusiasts to purchase Brush Car 621 from them, the tram will in turn be joining the ranks of preserved trams at The Living Museum of the North at Beamish in the North East of England. This move confirms the long term security of 621, with the transfer to Beamish ensuring that the tram will have a long future in preservation, operating on their tramway that runs around the museum. 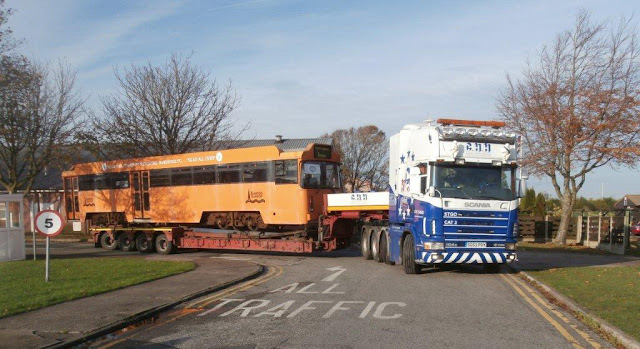 621 left its temporary home at Kirkham Prison in Lancashire on the morning of 11th November and headed for the North East. 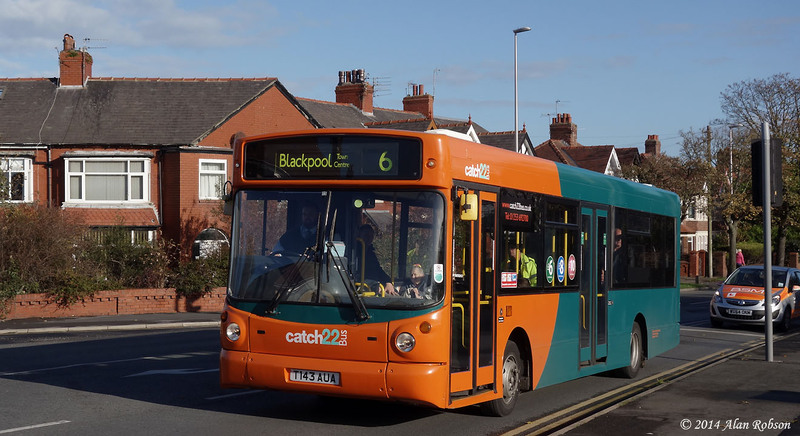 Brush 621 will initially go into storage when it arrives at Beamish, and will take a back seat behind other projects that are currently in the pipeline for the next 12 to 18 months. 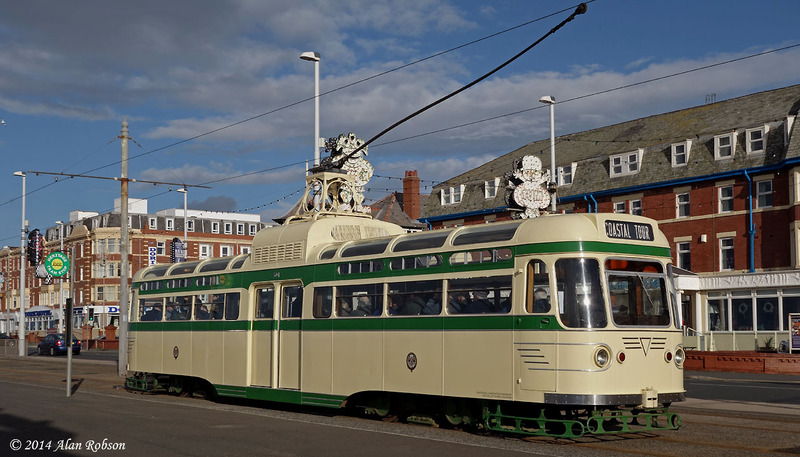 Current thinking is that 621 will be restored into the 1950s style of green and cream livery when it eventually reaches the top of the restoration queue. 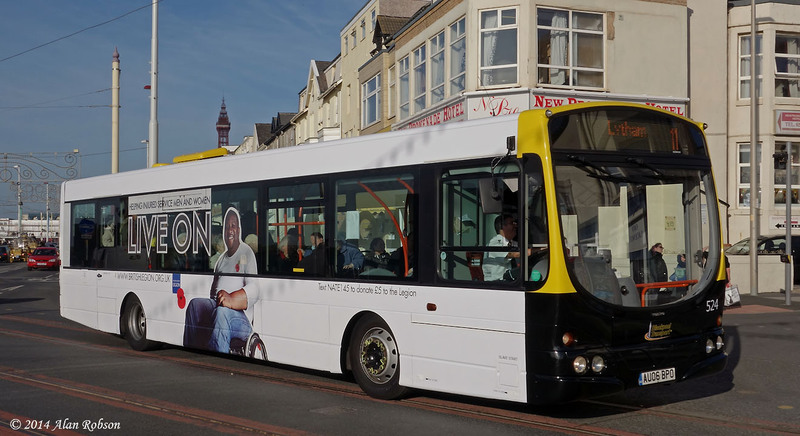 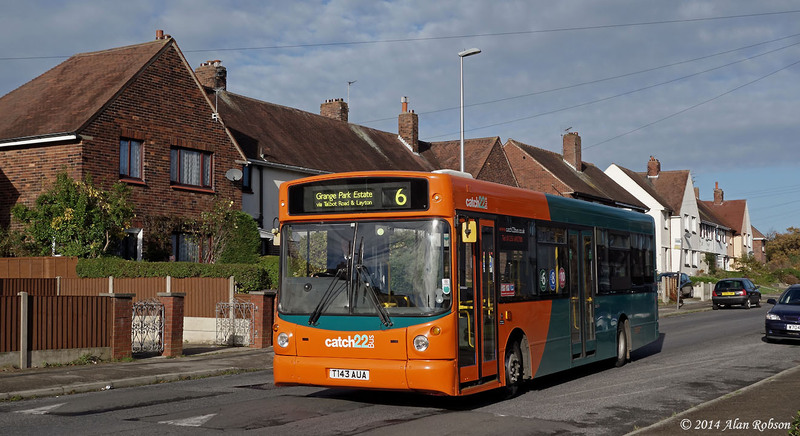 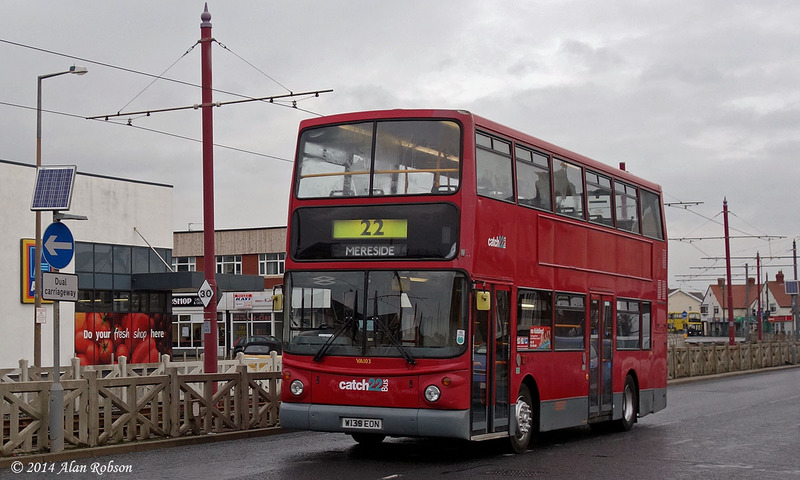 Former London United Volvo B7TL W139 EON (ex VA103) made its debut on Oakwood Travel's Catch 22 service between Mereside and Cleveleys today. 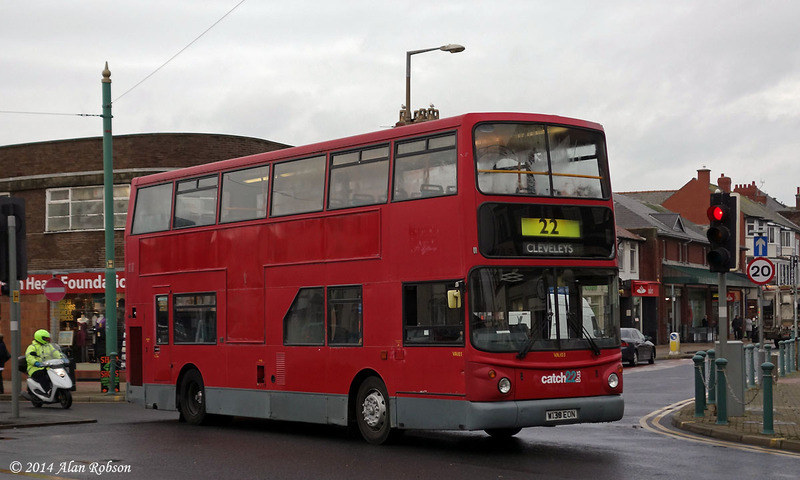 139 is fitted with two door Alexander ALX400 bodywork, the original plan was to convert the bus to single door configuration before it entered service, but the conversion will now take place in 2015 instead along with a fresh repaint. 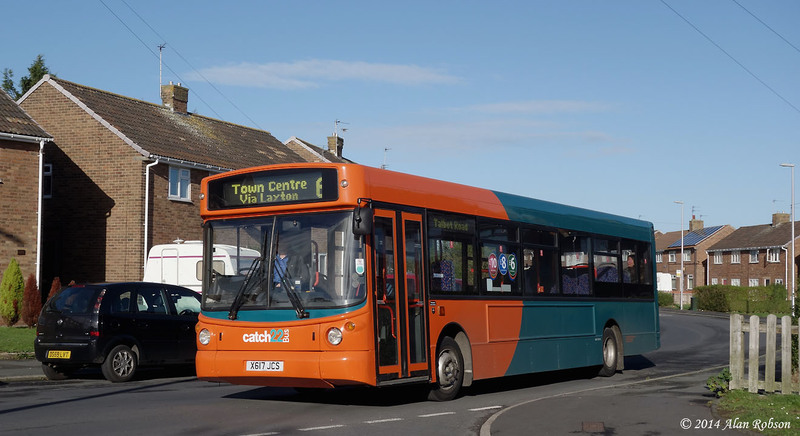 The bus entered service still wearing its London United livery, but with new Catch22 logos applied. 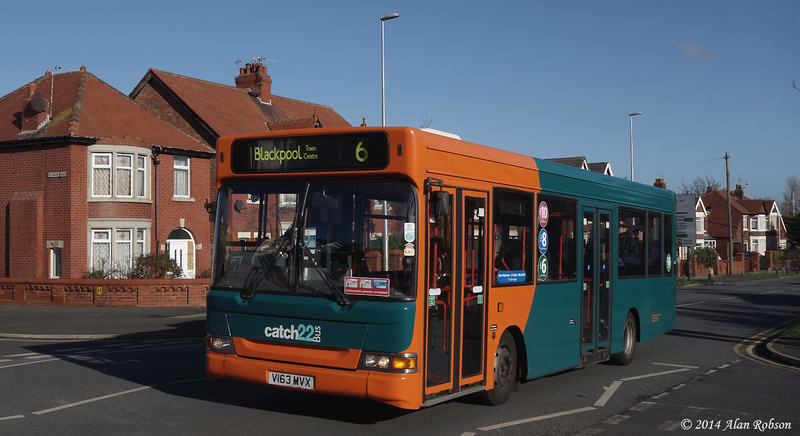 Oakwood Travel's new bus route from Blackpool town centre to the Grange Park Estate via Layton began operating on Monday 3rd November. 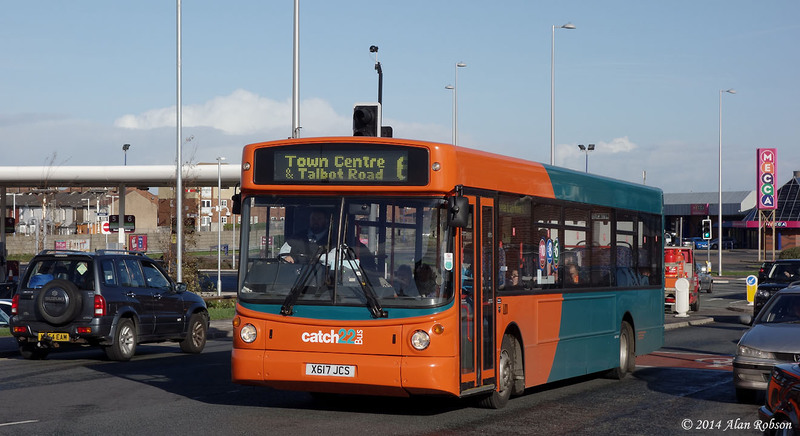 The service is operated by three buses which maintain a 15 minute frequency on the route. 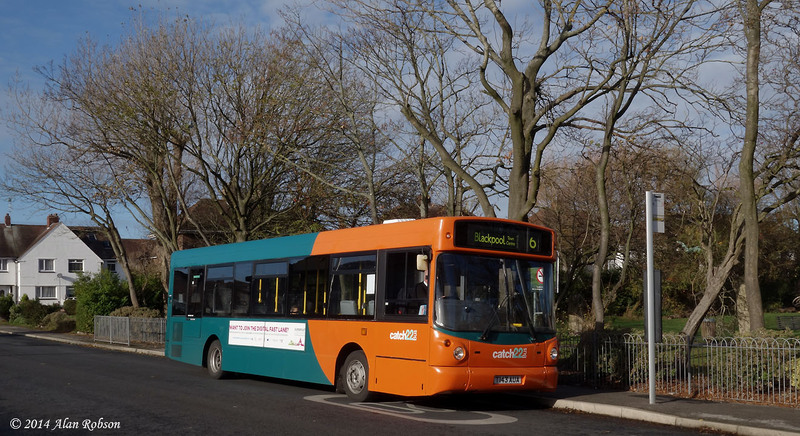 Here are a selection of photos taken around Layton and Grange Park on November 5th. 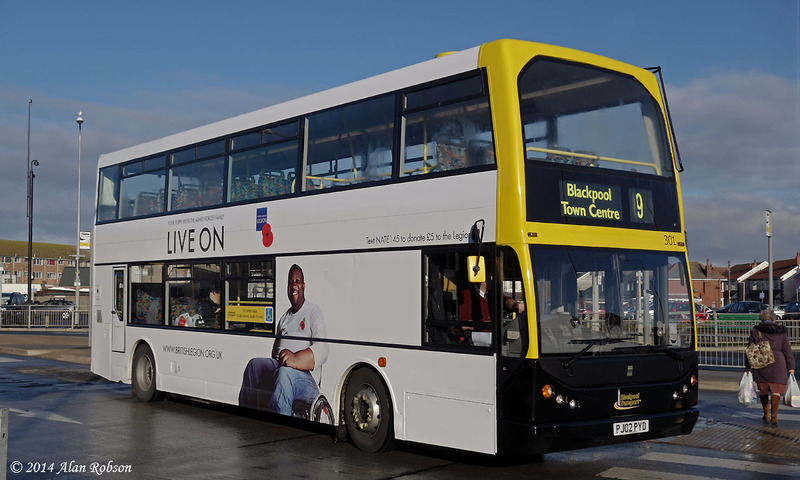 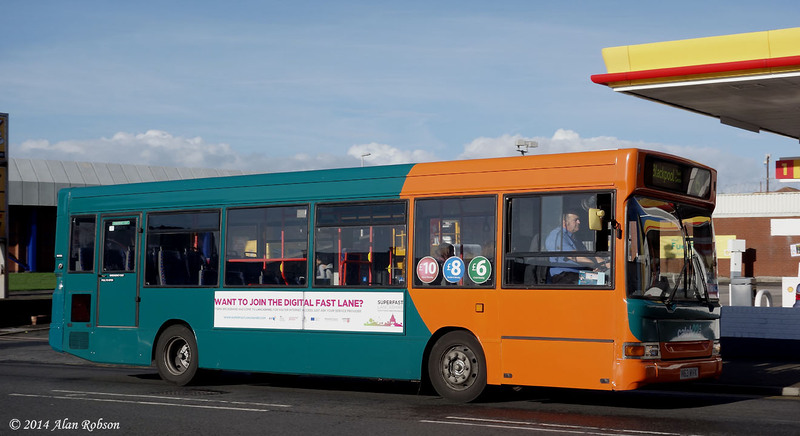 Blackpool Transport Dennis Trident 301 and Volvo B7RLE 524 have both received topical new overall adverts for The Royal British Legion's poppy appeal. 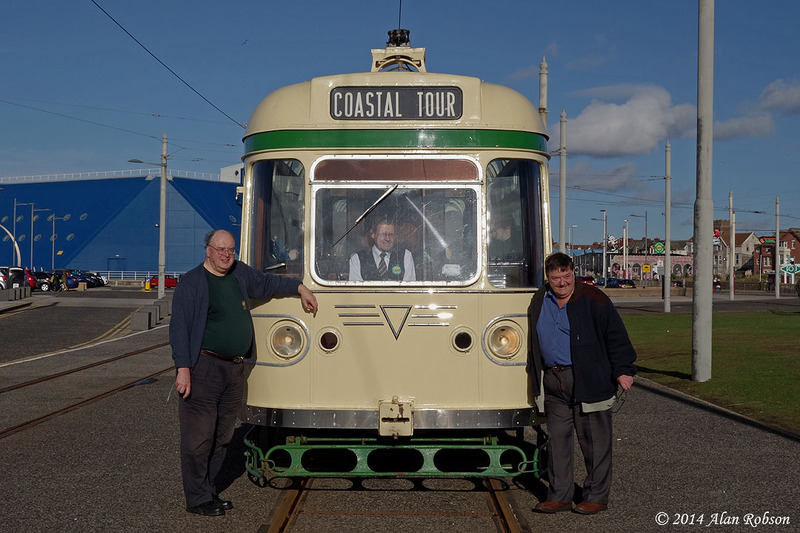 Coronation 304 was chartered for a private hire on Monday 3rd November to celebrate the 65th Birthdays of Alan Kirkman and Harold Hull. 304 picked up the birthday guests in Hopton Road outside Rigby Road tram depot, before proceeding to North Pier to collect more passengers. 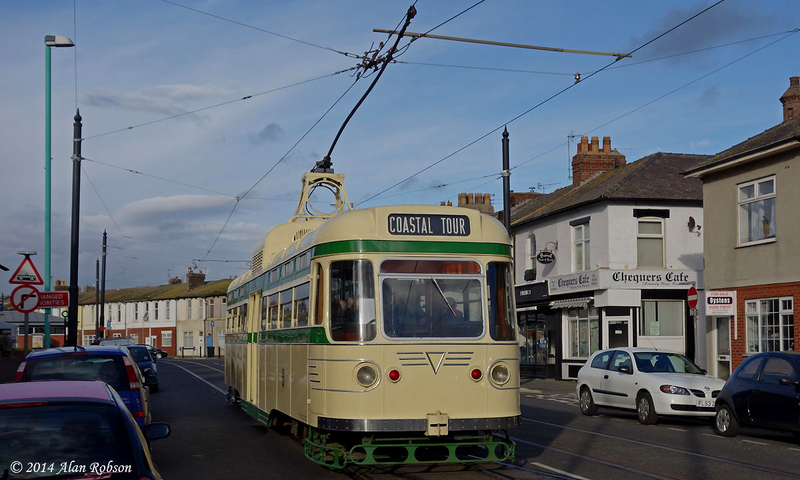 The tram then ran north to Little Bispham turning circle before heading back south to the Pleasure Beach, where a short photo break was taken. 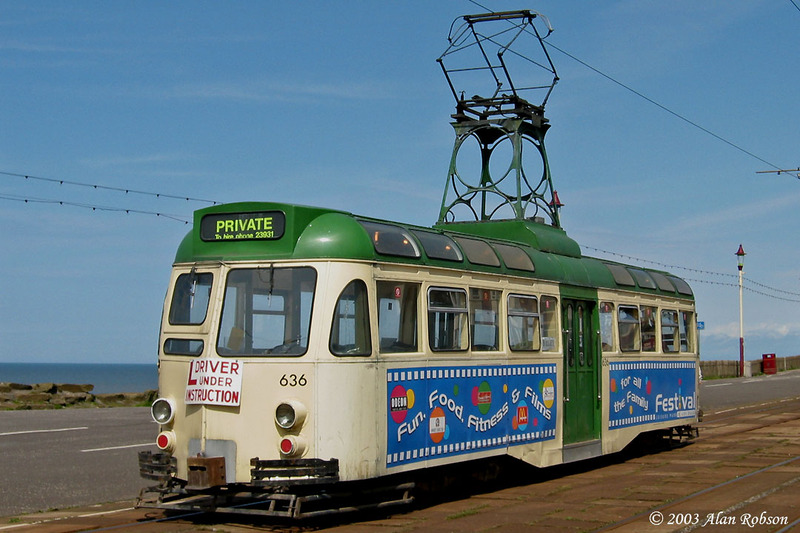 After departing the Pleasure beach, 304 ran all the way to Fleetwood Ferry, with a short photo call at the Cabin. 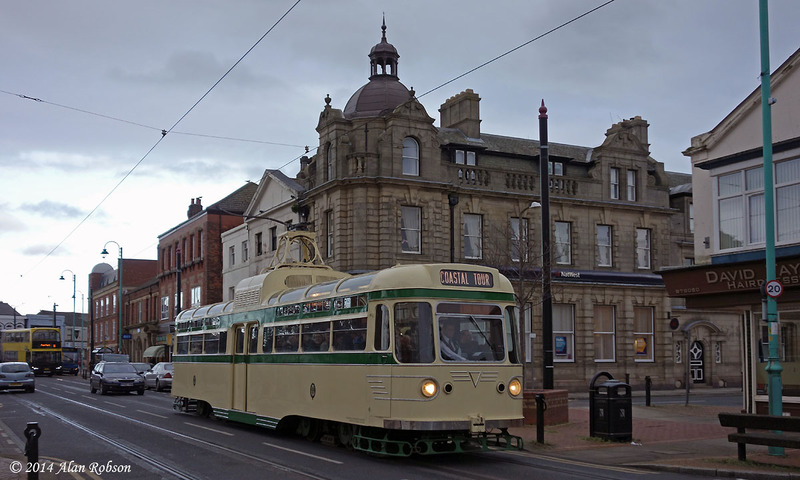 On departing Fleetwood, Coronation 304 headed south to Bispham where a crew break was taken. 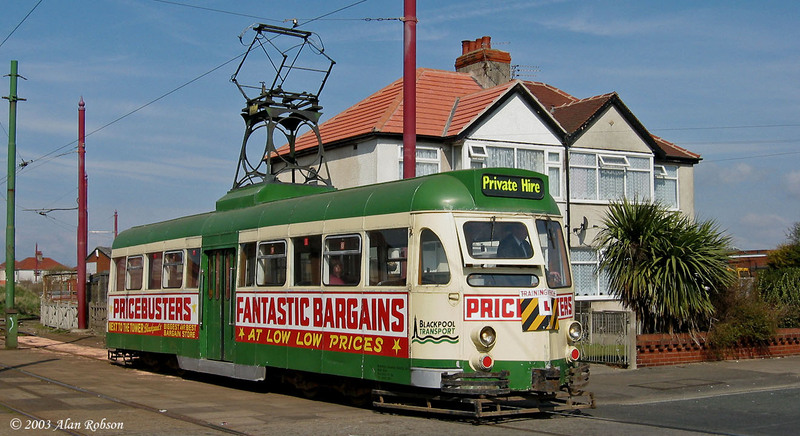 After the break at Bispham the party headed back to the Pleasure Beach and north again to Little Bispham. 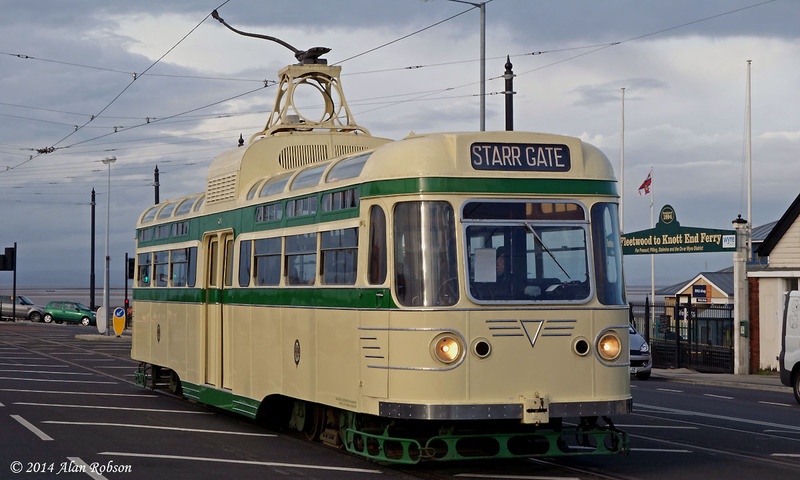 Lastly a round trip to Starr Gate and back was made through the Illuminations, before the tram finally headed south to North Pier to drop off its passengers, then back in to Rigby Road depot. 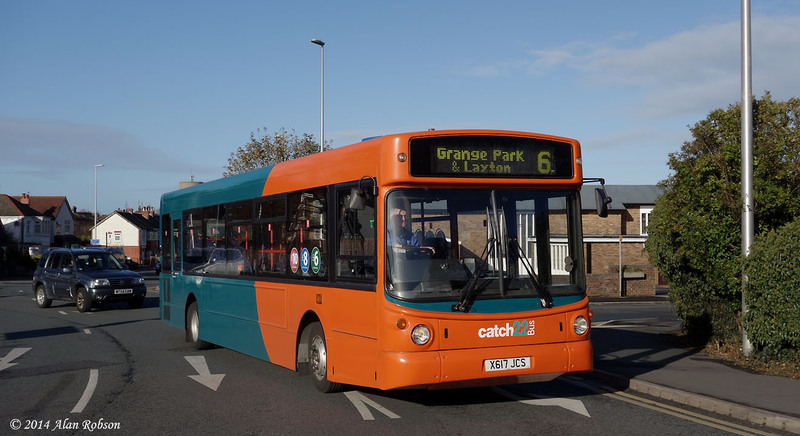 Oakwood Travel began operating a new bus route on 3rd November between Blackpool town centre and the Grange Park Estate via Layton. 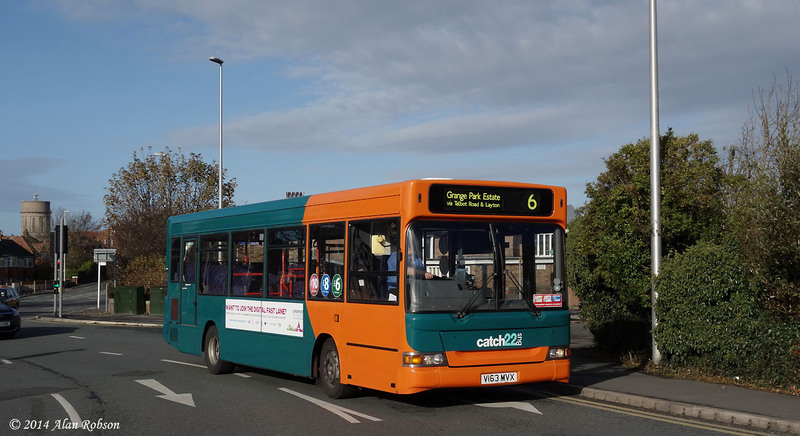 The new Service 6 operates on a 15 minute headway between approximately 0730 and 1800. 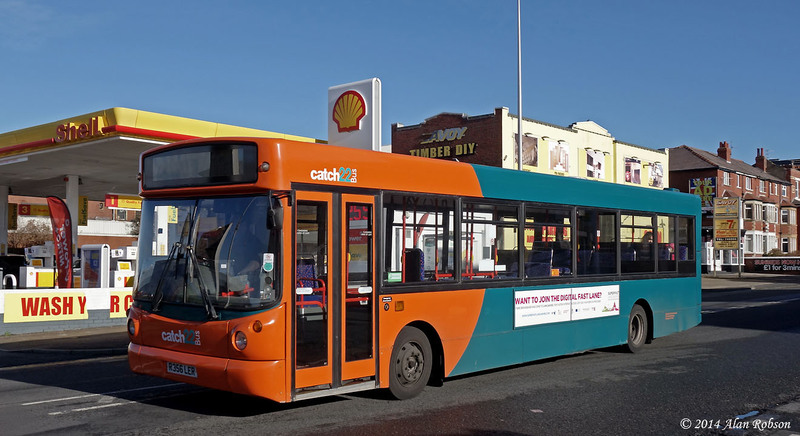 Former Stagecoach Dennis Dart X617 JCS was noted making its service debut on the new route.